Week 17 sees four consecutive days of MLS action, with Jose Carlos Rivero and Juan Guzman the two referees getting things under way on Friday night. Rivero returns to the venue where he made his MLS debut – Toyota Park – for Chicago Fire’s game against San Jose Earthquakes. Guzman, a US Open Cup referee back in 2013, takes the whistle for Real Salt Lake against D.C. United. Eastern Conference leaders Philadelphia Union are in action on Saturday, away at Houston Dynamo. Edvin Jurisevic is the man in the middle for that one. Ismail Elfath on fourth and AR Mike Rottersman are also part of the crew, and both were involved in the 2015 MLS All-Star Game. 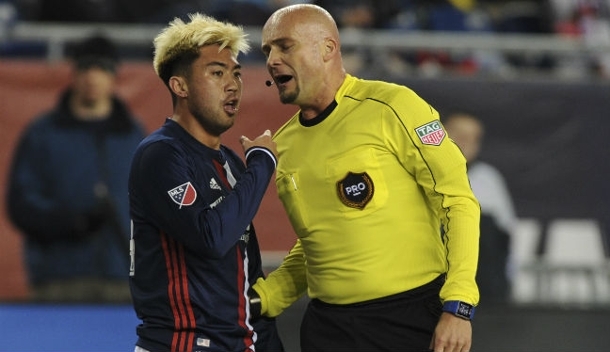 This year, that honor of center referee goes to Chris Penso – and the 34-year-old will earn his 11th assignment of the season on Saturday when Montreal Impact host New England Revolution – more than any other referee so far. Kyle Atkins continues his return to action with a third consecutive outing as AR. Kevin Stott referees Toronto FC versus Seattle Sounders in Saturday’s other game with Phil Briere, Adam Wienckowski and Mathie Bourdeau making up the crew in Canada. Two games take place on Sunday, the first of which will see Hilario Grajeda take control when the New York rivalry continues at Yankee Stadium. City will be seeking revenge for the 7-0 thrashing in April. Last year’s US Open Cup champions Sporting Kansas City play Columbus Crew in Sunday’s other game, and Corey Parker returns to domestic action after representing PRO at the Copa America. Ted Unkel will referee the game at Children’s Mercy Park, with Jeremy Hanson and Alex Chilowicz completing the crew. And then onto Monday for some Independence Day soccer! A further three games take place to round off week 17, with Western Conference leaders Colorado Rapids in action at home to MLS Cup champions Portland Timbers. That match-up has been tasked to Ricardo Salazar, while Silviu Petrescu takes the other 9pm game between FC Dallas and Orlando City. Week 17 closes in Los Angeles, where the Galaxy will come up against Vancouver Whitecaps – who are one of the teams involved in Paul Rejer’s latest Play of the Week. Center referee Robert Sibiga will be joined by Corey Rockwell – another AR who has been away on Copa America duty – and two of the Mariscal family, Apolinar and Alejandro. The NASL returns this week, and those assignments – along with USL and NWSL – can be found below.